We’ve added a full-timer to our house-on-wheels, but only for a long weekend. 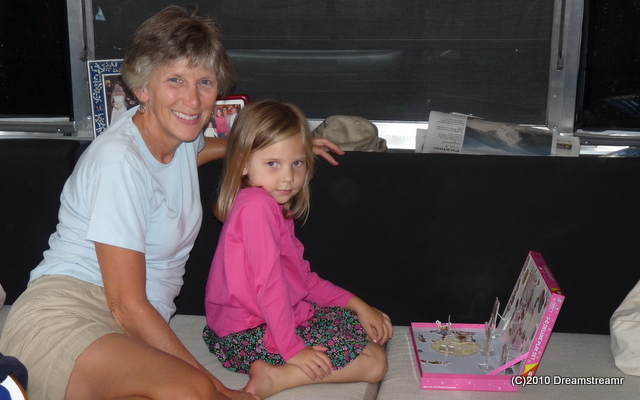 Our granddaughter, Ellie, has joined us for a few days. Hopefully we’re working up to a week away with grandmom and granddad. 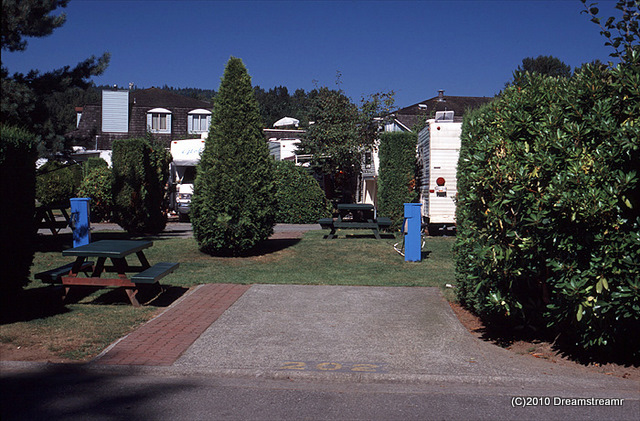 This is our second visit at Burnaby Cariboo RV Park (BCRV), and it’s a great place for us and for us to entertain her. 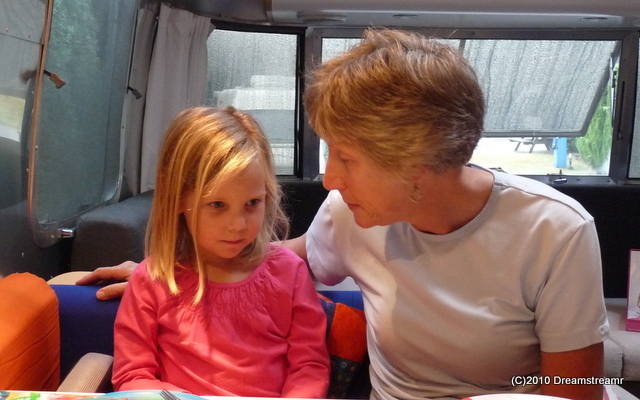 Three years ago, our first RV visit to Vancouver, we stayed in BCRV for two weeks. Last year, and the year before, we parked our house at Capilano RV Park in West Vancouver. 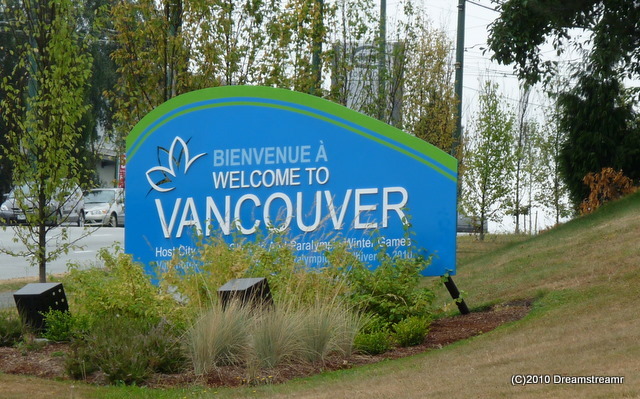 Capilano is closer to Kelsey’s and Stephen’s house and is the closest RV park to downtown. A stay at Capilano involves our driving across Vancouver’s business district twice daily and it’s a very hectic drive. Capilano has a small outdoor pool and an indoor hot tub; a lounge with wifi; a playground; and a convenient comfort station with showers and flush toilets. And it has all the noises of the big city, since it’s situated at the base of the Lions Gate bridge. BCRV, on the other hand, is 6 miles east of Vancouver. While it isn’t as close to Canada’s Highway 1 as Capilano is to the bridge to downtown, BCRV is adjacent to a railway line. A few times a day we can hear the trains rumbling by. The biggest difference we see between the two parks is the layout of the sites and the amenities. 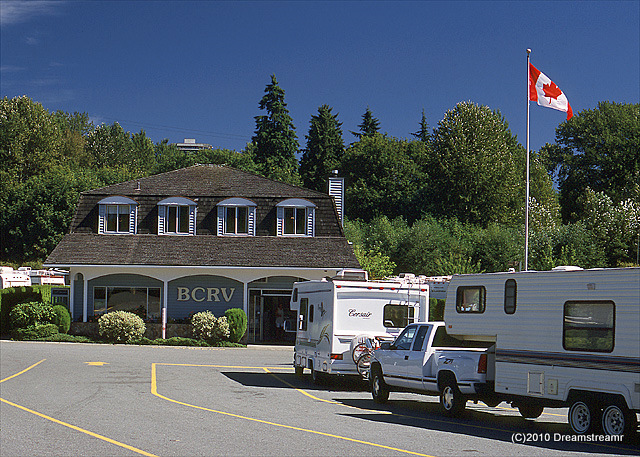 BCRV, a larger park, seems to provide almost twice the site space for your trailer or motor home. And the sites at BCRV are screened from each other with an attractive and tall cedar hedge. Our four annual visits have all been during the month of August, yet the air temperature is just a little cool sometimes for bathing out of doors. The indoor pool at BCRV is just the trick for the sometimes cool days in Vancouver. BCRV also boasts a weight room and above the swimming pool has a large sunning deck. Both resorts are near shopping malls. The Lougheed Town Centre, near BCRV, is as accomodating as any small shopping mall we’ve encountered. It’s walking distance for a couple of adults but not when we’re walking with a four year-old. Capilano is only a few hundred yards from Park Royal Shopping Centre, a much larger shopping center. This year we chose BCRV. We decided we prefer the amenities and sites of BCRV and driving Highway 1 instead of commuting across center-city each day. Next year, who knows? We felt Welcome to Vancouver! Vancouver welcomed us a week ago with warm sunny weather. We launched immediately into our tour and errand mode with Kelsey, Stephen, and Ellie, visiting the Science Center, China Town, a coffee shop on Kingsway, Rona (their hardware store), Murchies Tea Shop, a fabric store, and IKEA in Richmond. The HR MacMillan Science Center was a treat for us all. We visited the planetarium for a short program on the summer skies; watched a program entitled “The Colour of Fire” (our favorite was the green flame from cupric chloride); and toyed over an hour with fun exhibits. We needed to renew our supply of green tea. We have visited Ten Ren Tea in Vancouver’s China Town each year. 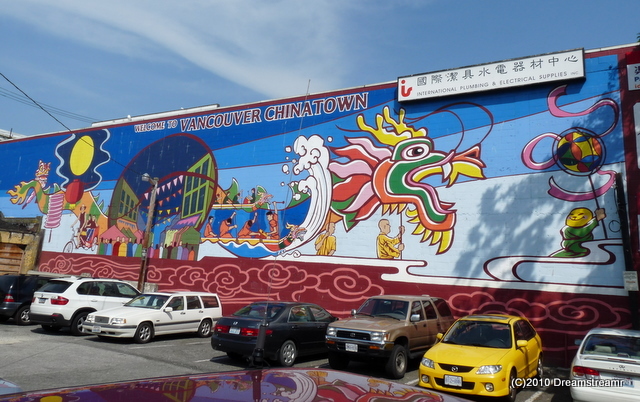 Vancouver’s Chinatown is the largest in Canada and (after San Francisco’s) was the second largest Chinese population outside China’s mainland. After much research, we agreed to buy the sencha green tea to which we’re accustomed, some matcha powder, and Dragon Well or Lung Ching tea. We weren’t sufficiently prepared to select from twelve different grades of Dragon Well tea. While we almost certainly did not buy a high grade, our tastes are still too elementary too really appreciate the difference. The tea stores are very nice, especially Ten Ren Tea in Chinatown. We have heretofore saved our annual tea buying for our trips to Vancouver. Both Murchies Tea and Ten Ren Tea also provide very good on-line shopping. You can spend far more for tea than we’d imagined — $280 for a pound of First Flush Dragon Well, for example. But you also can find the teas priced for everyday use, like Ten Ren’s High Grade Sencha for $30 per pound. Neither store charges tax, whether buying in-store or on-line. And both have very low shipping/handling costs for orders. Four pounds of white tea from Ten Ren ships for only $8.10 (shipping/handling) to Charlotte, N.C., for example. Ellie came home with us yesterday for the weekend. We right away spent the day visiting Burnaby Village Museum, grilled out, and settled in for a viewing of the movie Tinkerbell before bedtime. The Burnaby Village Museum is a gem. 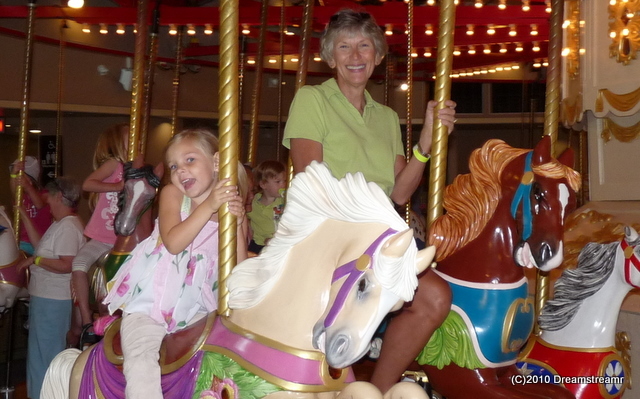 Ellie’s purpose for the visit was to ride the carousel. And she did, four times. We strolled around and viewed a few exhibits, rode the 1912 CW Parker Carousel twice, toured the park again, rode the carousel twice again, and finished with tours of the three houses. 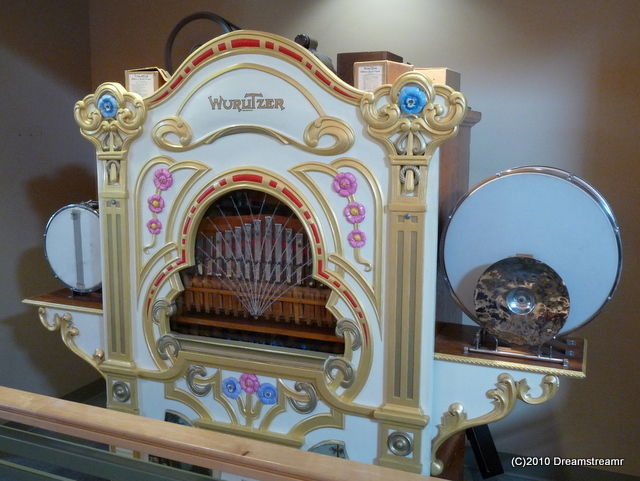 The carousel is faithfully and gorgeously restored and turns to the tunes of a likewise well-restored 1925 Wurlitzer band organ. We were surprised by how quickly the carousel turned and delighted with how beautiful the horses and entire carousel are. We would have enjoyed almost the very same activities whether or not we were walking with a four year-old. The park has exhibits and activities for almost all ages from four to one hundred-four. 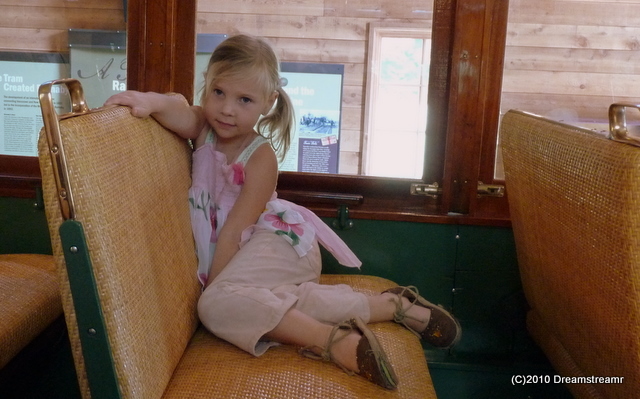 One of the highlights was our visit to the restored tram car. 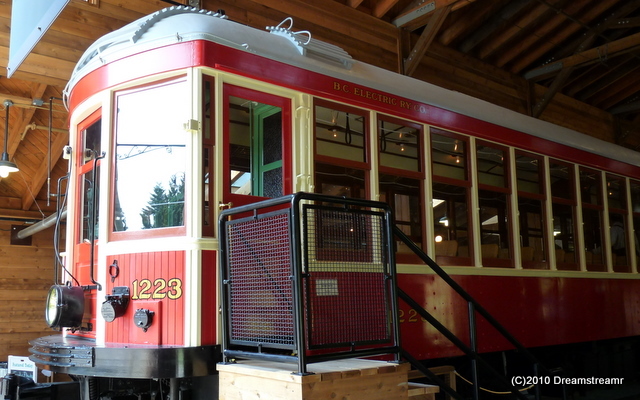 Car #1223 moved people and goods throughout the Lower Mainland between 1913 and 1958. This was an Interurban electric tram car built by St Louis Car Company in 1912. These Interurban trams were wider and longer than streetcars and designed to carry travelers for the relatively longer trips between Vancouver and New Westminster. This car was retired in 1958, when buses replaced the trams. Much of Burnaby Village Museum portrays life and structure cerca 1925. 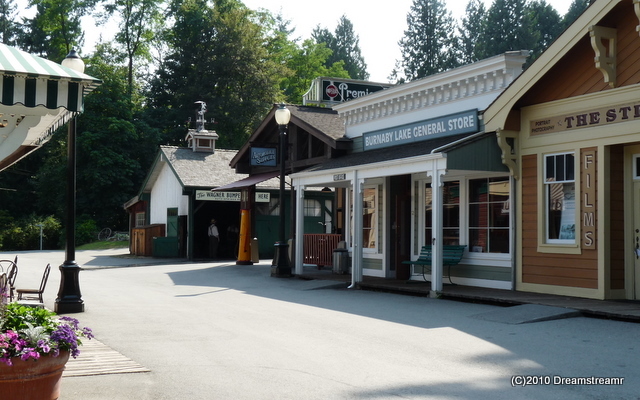 The carousel, blacksmith, newspaper, ice cream parlour, auto garage, dry goods, interurban tram, and several houses are all restored to that period. 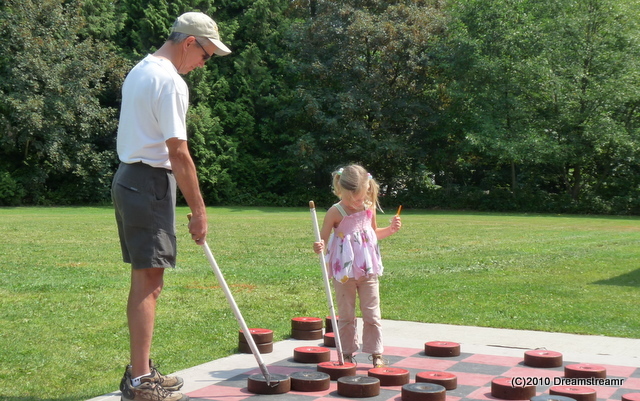 Jim and Ellie played a rousing game of lawn checkers. Not sure if this is also a vintage activity, but they enjoyed it just as well. This morning we awoke to grey skies and a densely misting rain. Good thing we have nowhere we have to go. We spent a leisurely morning playing Fancy Nancy before we slipped over to Lougheed Town Centre for earring and outfits shopping and a cup of coffee. 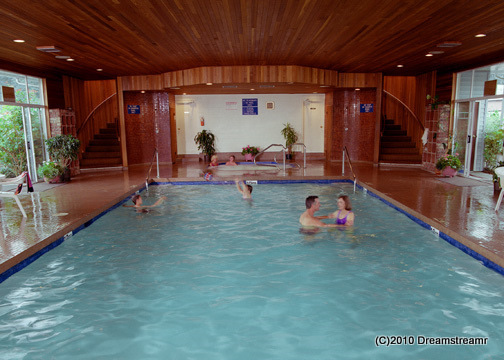 After a Tim Hortons small snack at the mall, we walked to the RV Park’s indoor swimming pool. We all three swam and swam and swam. Ellie jumped in a few dozen times and finally hit the showers with Debbie before we walked back to our house. We all watched Thumbelina (second time in three days), one of us (not Ellie) took a nap, and Deb started fixing dinner. No grilling tonight, it’s rained all day and continues through this evening. This is the rain Vancouver hasn’t seen throughout the past three weeks. We aren’t put off — instead of grilling we’ll eat dine inside on pasta, baguette, and fresh broccoli. We’ve been in Vancouver one week and already done all these things. 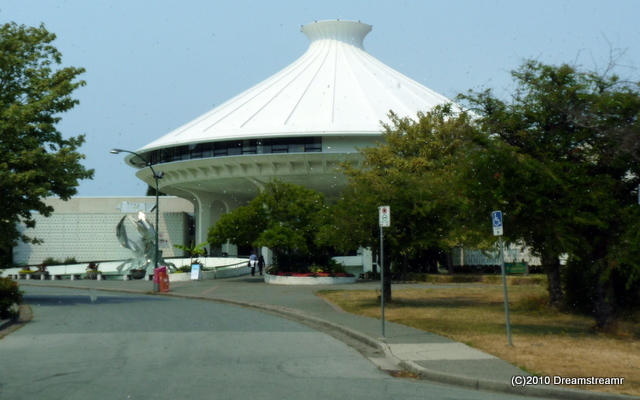 There’s still plenty to do, and we have another week to spend enjoying Vancouver’s great weather and many attractions. Wow! Going over all this again tires us. Ellie’s asleep on our pull-out sofa. Her stuff is crammed on one of our dinette benches. Our weekend living in our house with a third person, even a half-pint, doesn’t compare to full-time family living in an RV. But it does give us a little taste of it. Space for playing, dining, dressing, and stuff are all a little tight. Oh, and time to sit still or read quietly or just do nothing? Maybe we’re tired from keeping pace with a four year-old? Gotta go — she’s asleep and it all starts again when Ellie awakens.